While flying under banners of black and gold, the US Army Golden Knights will perform during the 2014 South Shore Air Show, set to take place at Fair Oaks Farms in Newton County July 11 through July 13. The US Army Golden Knights is the Army&apos;s official parachute team. With teams both competing in competitions and demonstrating their skills during air shows and special events, crowds are entertained by their precision and maneuverability. Beginning their shows at an altitude of 12,500 feet, the US Army Golden Knights showcase maneuvers and formations such as the baton pass, the cutaway maneuver, the diamond track and the diamond formation. 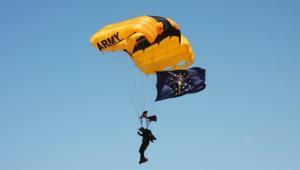 To view a video of the US Army Golden Knights, visit http://bit.ly/1nUhZDs. Fair Oaks Farms is a 33,000-acre attraction, allowing the South Shore Convention and Visitors Authority and Fair Oaks Farms ample room to make additions to the family-fun event. Attendees will enjoy breathtaking aerial acrobatics, Fair Oaks Farm attractions, military displays, a beer garden, food and novelty vendors as well as new additions. For more information on the South Shore Air Show, visit www.southshoreairshow.com.